Ideal for transferring and extracting wood shavings, sawdust, woodchips, pellets, granules, stock feeds, sugar, grain, aggregates’, glass and any other abrasive product. 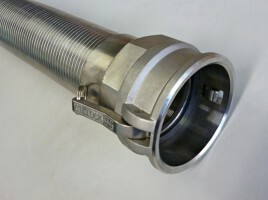 For fume and exhaust extraction this ducting made from 304 grade stainless steel can handle temperatures up to 650 Deg C. Can be clamped, welded or as an assembly with fitted camlock coupling. Also suitable as an armour to protect other hoses that are in vulnerable situations. This stainless steel interlocked hose can be made in sizes from 32mm to 457mm(18″) diameter and cut to any length required.